Let’s cut right to the chase. Steve Byk, the voice of Thoroughbred racing, is human in flesh and blood, but it would be difficult to convince anyone that he isn’t an android, more simply a robot with human appearance; a mental cyborg. The only other explanation for Byk’s other worldly ability to assimilate information on any subject, especially Thoroughbred racing, is that there must be a microchip that has been implanted in his brain. What other explanation can you give for someone who can line up racing’s biggest personalities, whether trainers, owners, breeders, journalists, authors, racing officials, handicappers, veterinarians, and spokespeople from every important organization and converse with then as if an expert on the subject at hand. Byk has the ability comment on every aspect of the sport and can keep up with the experts, no matter the subject. In addition to his daily radio show “At the Races With Steve Byk,” which airs Monday to Friday from 9 a.m. to noon Eastern time on Sirius/XM radio, Byk operates his own website, makes daily selections, runs his own racing partnership (Dee Tee Stables), participates in his racing forum, co-hosts the Capital OTB TV show “Loose on the Lead” with Seth Merrow, participates on the internet fan education show “Night School,” provides handicapping and analysis on major stakes for Xpressbet.com, and supplies Beyer speed figures for every stakes, as well as entries and results. He even goes so far as to point out where his selections finished in red type. Now that is meticulous. That is another reason why I am convinced Byk exists on another plane from everyone else and his day actually encompasses 36 hours, for no human being can accomplish all Byk does in a 24-hour period. No one has yet to figure out when he does his handicapping, but he comes on the air and analyzes races, whether stakes or allowance races, and when he has trainers on, he discusses in detail every one of their horses who has recently run or is scheduled to run. His home has taken on the image of Willy Wonka’s chocolate factory. No one goes in and no one comes out and no one ever sees what goes on in there, but out comes thousands of candy bars daily. As for being in tune with the industry, there is nothing that goes unnoticed by him, from who’s seeing who to where a particular trainer had dinner the previous night. He has seen every old movie and TV show in existence and can quote lines from them. He cooks a Thanksgiving feast every year that would have King Henry VIII unbuckling his belt. If there is such a thing as an ambidextrous brain, Byk possesses one. Unlike mere mortals, he has the ability to conduct an interview on any subject while texting and emailing without missing a beat. If you can’t remember who won the 1982 Carter Handicap or a particular sire or the time of race, Byk will have the info within a matter of seconds…while he’s taking to you. After going through several producers he finally found the Robin to his Batman in Casey Ghee, who calls the guests every day and whose creative musical mind compliments Byk perfectly and provides entertaining and offbeat music as lead-ins. Perhaps what makes Byk’s unearthly powers even more remarkable is that you can name just about any city or town in America and he’ll tell you where you can go for the best burgers or pizza. When I discovered the greatest egg sandwiches I’ve ever tasted at Wegman’s in Hunt Valley, Md., while covering the Preakness, I later discovered it was Byk who supplied Wegman’s with those eggs – the tastiest and fluffiest I’d ever tasted. Figures. I often think back to the mid-2000s when I came across a racing website before there were racing websites and blogs. 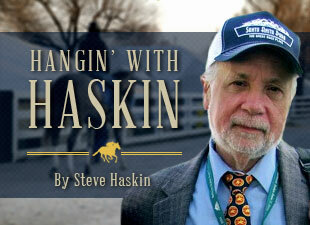 I took notice of it because it was called “Derby Trail.” Well, considering my Blood-Horse column during the winter and spring months was called “Steve Haskin’s Derby Trail,” I couldn’t help but be intrigued. I saw it was run by someone named Steve Byk, who was just getting into racing on a serious level, and there were about 50 members, so as a lark I joined up. Little could I have known that I had latched on to a comet. When Steve had some inside information on a well-known horse I arranged to have him write a short story for Blood-Horse. When word began to trickle out about him, he went on a daily radio on Sirius on which I was a regular guest, then appeared again and again before he came a regular and then co-host before taking over the show in 2007 and turning it into the most informative and most listened to racing radio show in the country. At first he would beg and grovel to get racing’s big names on his show, but in just a few years those same big names were begging to get on, because that meant they had either won a big stakes, had a horse in a big stakes, or were making news in the industry. You weren’t anyone until you were on Byk’s show. Byk’s appeal goes far beyond his knowledge of every subject and ability to fill three hours every day. He doesn’t interview people; he converses with them. In all the years I’ve been a regular on his show I have never once felt like I was on the radio. It’s just two guys talking racing. The rest of the racing world just happens to be eavesdropping. There is, however, a negative aspect of Byk and his show I have to bring up. It is an absolute crime that he has never won an Eclipse Award, whether for some of his amazing tributes and retrospectives on late racing legends such as Bobby Frankel and Allen Jerkens, his flashbacks with veteran trainers and jockeys, who tell stories of the old days like they were sitting around a campfire, or simply exploring racing’s hottest and sometimes controversial topics. Byk has a treasure chest of great shows and great moments that should have won an Eclipse Award a long time ago. Part of that is because of the puzzling and inexplicable category in which his show must compete. Last year, he lost out to a terrific, but “written” historical feature by Mary Simon, which happened to have a few slide presentation photos toward the end, qualifying it for the audio/multi-media category. Simon’s story deserved an Eclipse, as her historical features usually do, but had no business competing in the same category as a radio show, especially one as comprehensive and encompassing and important to the industry as Byk’s. Even if Byk is not human as we know it.